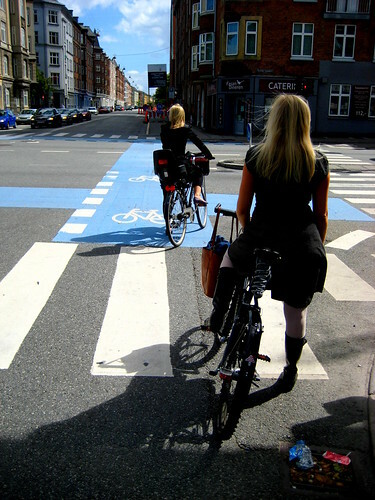 Take two to tango at a red light in Copenhagen. Copenhagener with a new plant in the process of transporting it home. 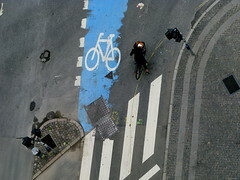 A different angle on cycling in Copenhagen. Flâneur was often used to describe Parisian photographers like Brassai, Robert Doisneau, Boubat, Willy Ronis(still around at 90+) and the much earlier Eugene Atget, well before Susan Sontag popularised the term. if you dont take my photo while im in copenhagen i will absolutely spew. im practicing my chic just in case. And of course, Walter Benjamin, though he was not a photographer (as far as I know). 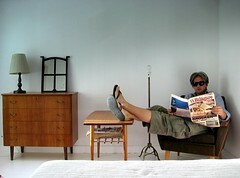 In the photo we see Zak, our modern-day Flâneur, perusing a Swedish magazine - but not the sort that Iggy Pop referred to. Our bikey-boy is reading 'Vi bilägare" - We Car-owners. So is he a closet petrol-head? My guess is he's just reminding himself of all the hassles he doesn't have to deal with, not owning one of those big hunks of metal. PS cool table but take your feet off it, puh-leeeze!! mex... let's line it up and do a feature!